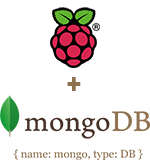 A while back, I compiled mongoDB 2.1 for Raspberry Pi based upon instructions found on other sites and kind work by developers sharing code on Github. I acquired a Raspberry Pi B+ and tried to compile mongoDB as I had done previously. I quickly found out that the (old) compiled version (2.1.1) no longer functions under Raspbian. I had also been trying out Arch Linux for R-Pi as it was “lighter” and did not include all the GUI/X components that I don’t use. I use R-Pi for more server centric things and use frame buffer apps for video and images (omxplayer, fbi, fim). My effusive thanks go to the Arch Linux Package maintainers!